I would agree except “just because they got hurt” is superfluous. Financial disaster from some sort of healing is obscene. But then so are our maternity statistics. great. 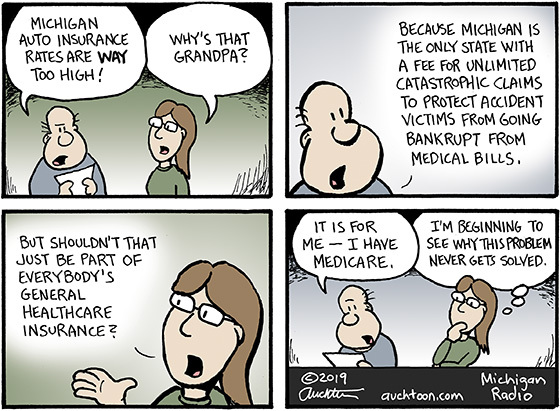 You will have a hard time using Medicare to help reduce your premiums because Medicare does not “coordinate” with the Michigan program — that is if you go to an ER they will first ask if it is automobile related and if so will bill you at a higher rate (other insurances go along with this but the Federal folks take a dim view of this behavior.) I don’t think any of the deep pockets behind the campaign against the recent petition drive cared about personal bankruptcies but they sure did like having a nice stable, fat revenue stream like the MCCA.